Call it prairie noir or Canadiana desert rock: Toronto’s Abigail Lapell sings haunting, gorgeous modern folk songs. Her 2017 sophomore album, HIDE NOR HAIR, won a Canadian Folk Music Award for Contemporary Album of the Year. Hailed as an artist to watch by NOW Toronto, she’s toured across Canada, the U.S. and Europe, performing on vocals, piano, harmonica and finger style guitar. GETAWAY, Lapell’s ambitious third release, is out February 2019 on Coax Records. Produced and recorded by Chris Stringer (Timber Timbre, Amelia Curran), the album features a talented cast of local collaborators including Christine Bougie (lap steel), Dan Fortin (bass), Jake Oelrichs (drums), Lisa Bozikovic (piano/vocals) and Dana Sipos (vocals). 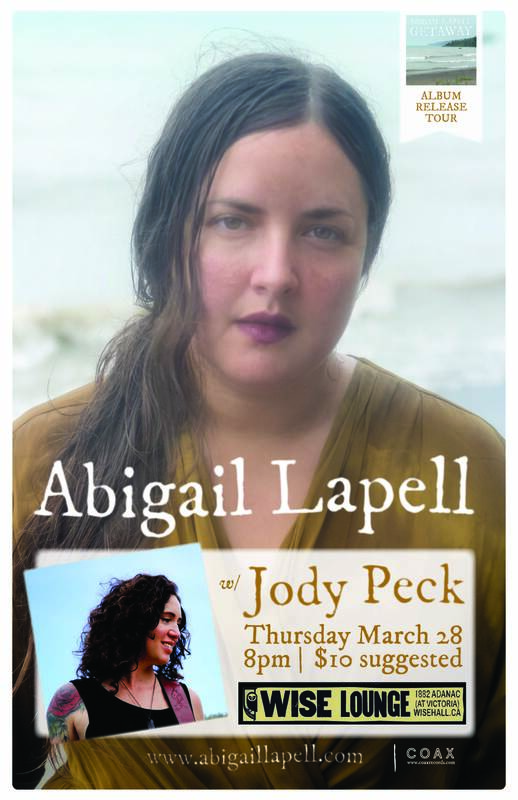 Vancouver based songwriter Jody Peck (aka Miss Quincy) introduces her solo show cooking up some serious vintage country soul. Inspired by her grandparent’s old time western band, a love of Patsy Cline and years of touring in a rock ’n’ roll band. Embarking on this solo journey allows Jody to perform her most personal songs, penned at her cabin in the woods and crafted in the spaces between life on the land and life on the road. She invites you, with the honesty and skill of a mature songwriter, into her wilderness of the Mighty Peace River. The songs chronicle stories of northern love, gunslingers, hunting camps and her legendary cook shack. This is the sound of a traveler returning home, headed northbound on the Alaska highway.